During the winter it often seems like what we expect to find on the trials is not what is out there while the unanticipated can create the biggest challenges and that was the case as the Trail Crew started the new year. Well, at least it wasn’t raining! Actually the weather was perfect for a day out on the trails! After splitting into the usual two groups in the morning, the crew1 lead was Dale Peterson (D1) and included Jan, Janie, Janette, David, Chris, and me (Mike). We headed up Gazos Creek Fire Road to check on several reported problems on the Skyline-to-Sea and Sunset Trails. 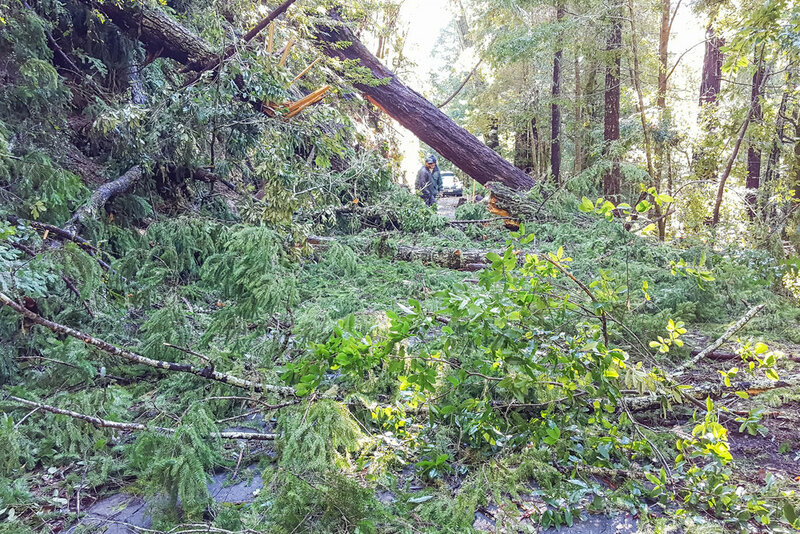 Just several minutes up the road as we headed to Middle Ridge our progress came to a quick halt as we rounded a corner and found a large Doug fir, smaller tan oaks, and the usual related debris all tangled together and completely blocking the road. 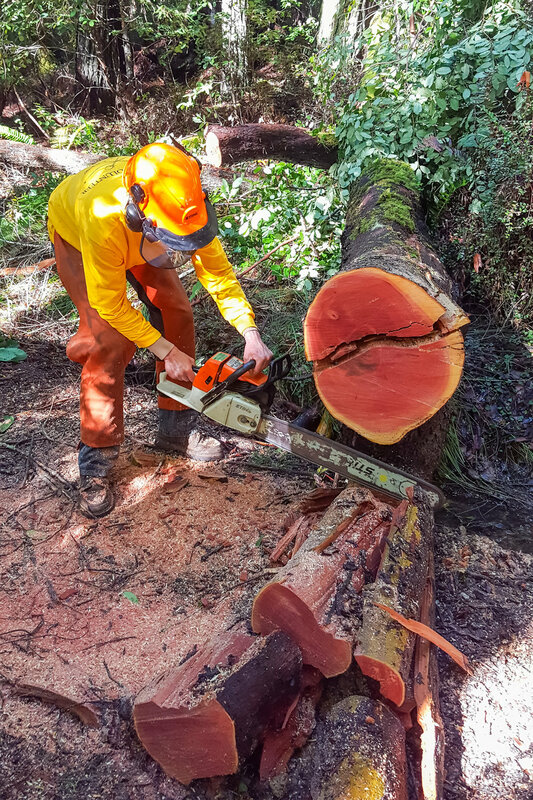 We quickly broke into teams with D1 manning the chainsaw while some cut and removed the small debris from the work area and still others had the difficult task of cutting the debris into smaller sections and finding places to hide it off the road. As we cleared the area of the small stuff it became clear that we could leave the Doug fir in place as there would be enough clearance to allow vehicles to pass underneath. After 2.5 hours of chainsawing, lopping, cutting and stashing, the road was clear enough to proceed to what we had expected to be our first stop of the day. But first lunch! As we ate on Middle Ridge at the Sunset Trail crossing several hikers came up from below and said there was a large tree blocking the lower Sunset so after finishing we broke into smaller groups with some heading off to check on the reported large tree while the others headed out on a Sunset-Connector-STS loop and the problems we started the day looking for. About 7-8 minutes after dropping down off Middle Ridge we came across another large Doug fir laying across the trail which we guessed was the tree the other group had been looking for over on the Dool Trail. We guessed the diameter of the tree to be about 42-44 inches and with only Chris Young's 18-inch chainsaw it didn't look promising. As we looked around to see what could be done we noticed the tree splintered into smaller pieces when it hit the ground so instead of a single 42-inch tree we had several smaller trees and Chris set about cutting the tree, layer after layer, like peeling an onion. As we worked, the Sunset-Connector-STS crew rejoined us and we finished clearing the trail. The 2nd crew was lead by Dale S (D2) with Peter, Michelle, Shyamal and me (Norm). 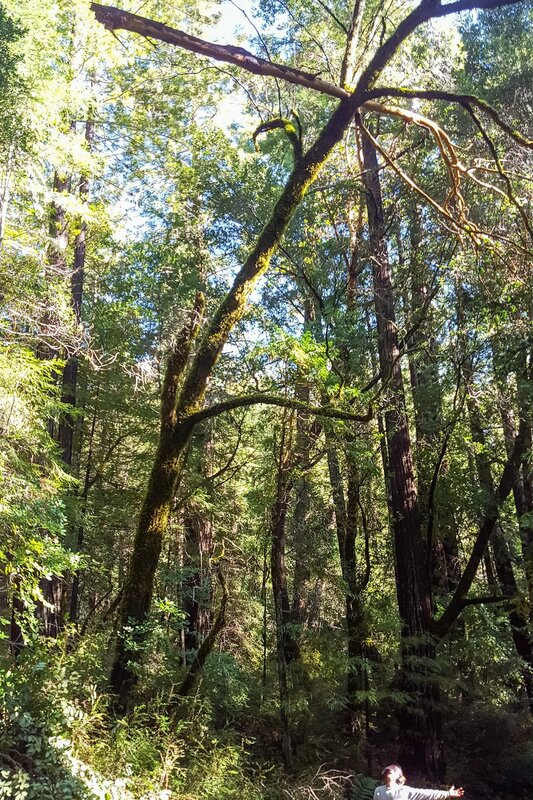 Our group parked in the Gazos Creek picnic area and headed up Dool Trail, looking for a 3’ doug fir that was blocking the trail with only a 2’ crawl space below. Going up the trail we did a bit of brushing, lopping and cutting with hand saws but reached Gazos road with no sign of the doug fir. We were about ready to cross the road and continue up Dool to Middle Ridge Rd. 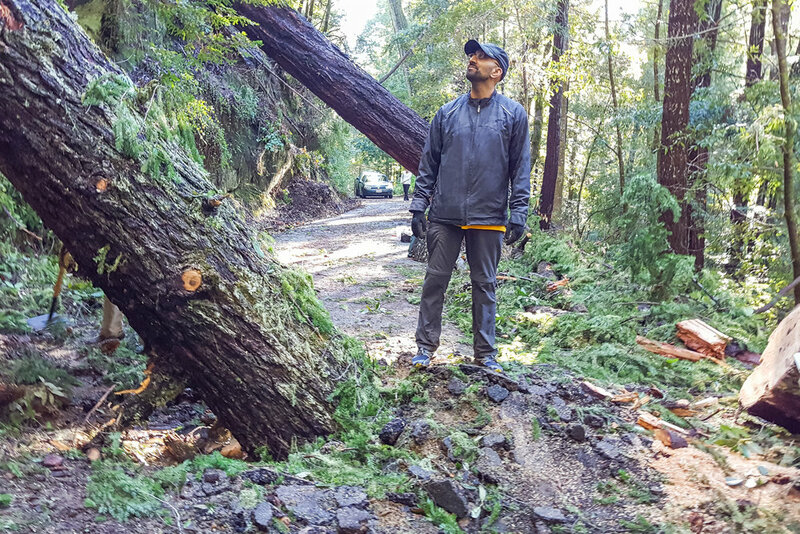 when docents Glen Joy and Kathy Willott came up the road and reported that just back down the road was a large madrone that had fallen across the road, splitting in the process. 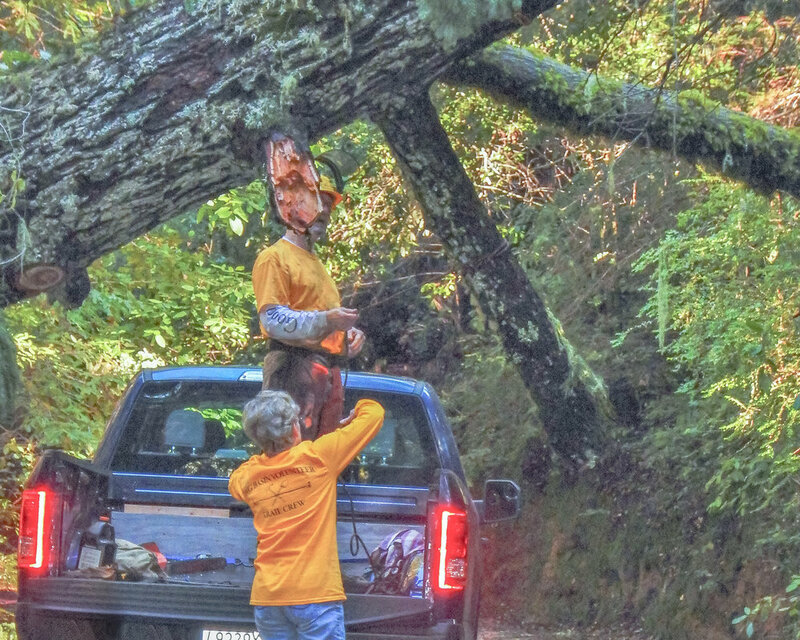 We decided to go back and take care of the madrone, then walk back to our cars, have lunch, then drive back up to Dool and take care of the Doug Fir. Just a bit down the road we came upon the aforementioned madrone that had a perhaps 2’ diameter but had split into two sections. There was also a very skinny doug fir that had fallen right up the middle of the road. 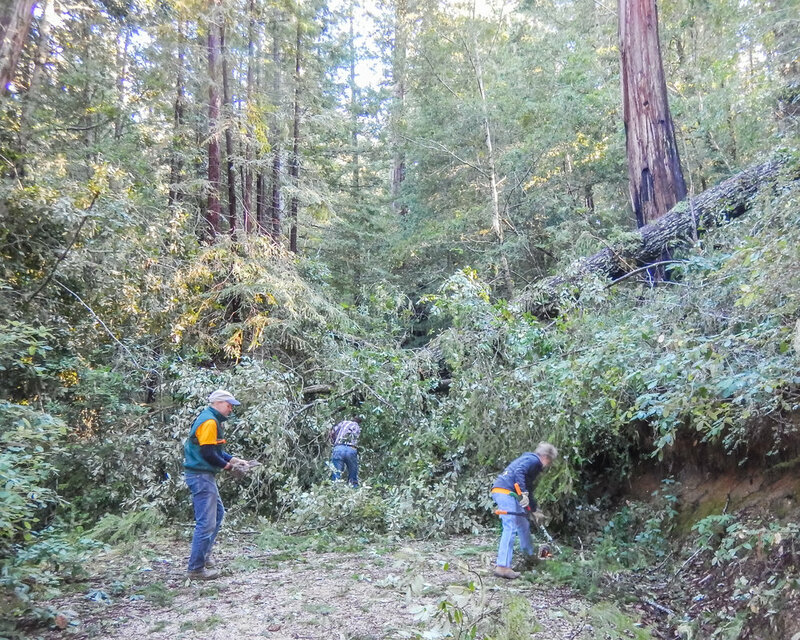 We quickly took care of that and started clearing debris so Dale could start the chain sawing. At one point we were standing back a bit from the cutting when Shyamal yelled and pointed right above where Dale was cutting. What he saw was the largest widow maker any of us have ever seen hanging across the road. We quickly remembered how heavy madrone is, especially when you are carrying 18-24” rounds. Kudos to Dale for some very imaginative cutting. 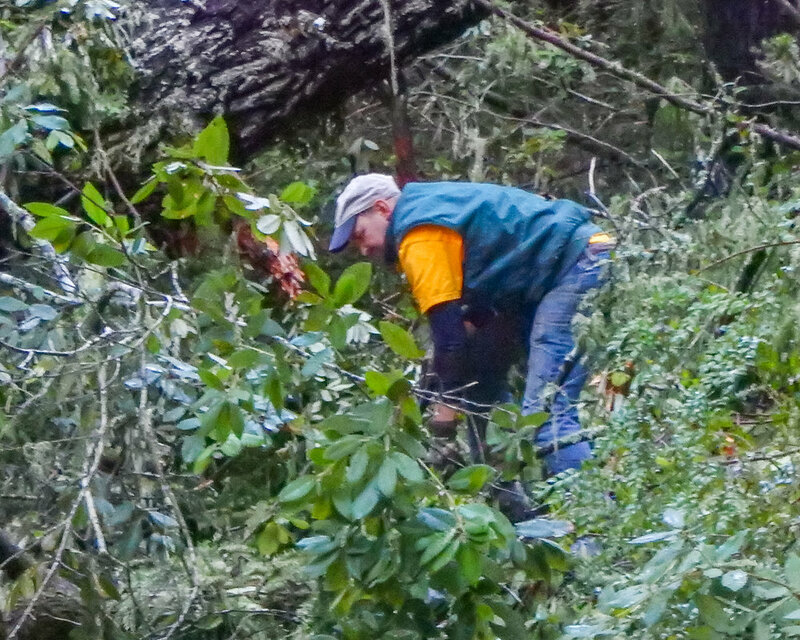 After taking “after” pictures we headed down Gazos where we had heard chain saws while contending with the madrone. Around a couple of turns we came across Mike & Dale1 and their group. They, well, Mike will tell you about that! We helped carry some debris from the road for a few minutes then headed back down to our cars to have lunch. After lunch we started up N. Escape Rd heading out to catch a downed tree and damage to the Meteor Trail that we hadn’t been able to get to the previous month. Going through the last gate we passed under the giant doug fir that we cleared last year, and it was still leaning in the air across the road but still passable. Just past that we came upon a pile of foliage and saw a couple of big doug fir trunks that had fallen way downhill, likely, we think, from near the Sequoia Trail. A couple of hearty hikers were coming down the road and we saw how they had to climb over the debris. As we started clearing branches, needles and such we saw what appeared to be asphalt chunks mixed in with the foliage. Upon further clearing we saw that one of the firs had actually speared into the pavement, pushing up the asphalt nearly 2 feet up. 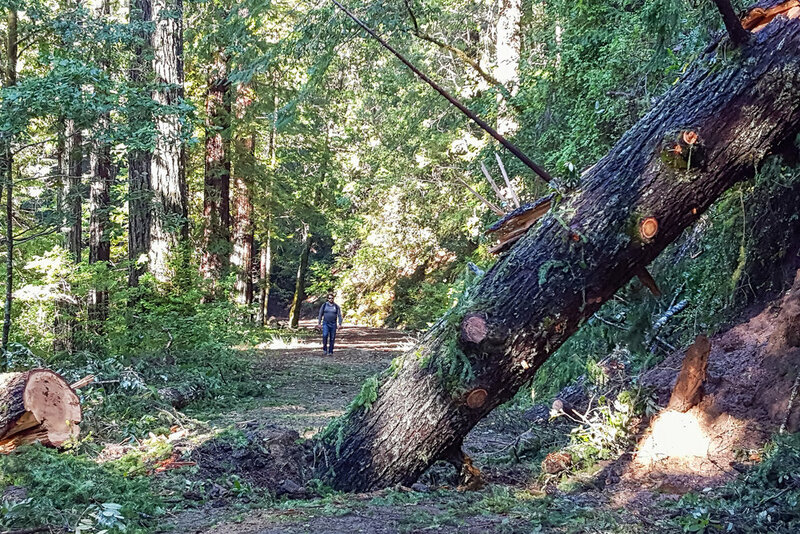 We cleared the area so that hikers can easily pass but removing the tree is going to be a major project that will require some major road work. A vehicle cannot get by it. It was a long day, with two big projects, but we made two areas passable for visitors and emergency vehicles. The crew put in 108 hours for the day with a year total of 132. Thanks to Norm Beeson, Michele and Peter Gelblum, Jan Hill, Shyamal Kapadia, Janie Liefhelm, Janette Mello, Mike Peasland, Dale Petersen, David Philleo, Dale Stadelman and Chris Young, from both crews for getting 2017 off to a good start.